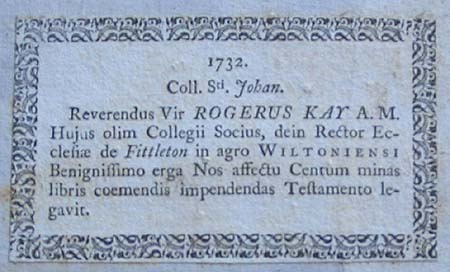 Roger Kay gained his BA from St John's in 1688, his MA in 1691, and became a Fellow. He was Rector of Fittleton in Wiltshire and Prebendary of Sarum until his death, while also founding the Grammar School in his native town of Bury, Lancashire. Kay left £100 to buy books for the Library. This was used to buy over sixty volumes, mainly of a theological nature. Typical is Bernard Lamy's De tabernaculo foederis, de sancta civitate Jerusalem, et de templo ejus, libri septem (1720), with its striking images interpreting biblical scenes and structures, such as Noah's Ark and the Temple of Solomon. Another item of particular interest is the second edition of Reelant's De religione Mohammedica libri duo (1717), which bears the first engraving that attempted to depict Mecca accurately. 1732. St John's College. The Reverend Roger Kay M.A., once a Fellow of this College, later Rector of the Church of Fittleton in the county of Wiltshire, bequeathed by his will, with most kindly affection towards us, 100 pounds to be spent on the purchase of books.